Angel Phillabaum says she never imagined she’d be where she is today. The 18-year-old Daviess County High School graduate is finishing her first semester at the J. B. Speed School of Engineering at the University of Louisville as a Girls Inc. National Scholar — one of just 15 young women from around the country who were truly inspired to be strong smart and bold. And earlier this month, Phillabaum returned from Los Angeles where she joined a handful of other national scholars who represented their local affiliates and states at an annual Girls Inc. Celebration Luncheon. There, she shared the stage with influential women such as actor and producer Reese Witherspoon and Shannon Ryan, an executive vice president at Fox Television Group. Some of those role models were her mother and Girls Inc. of Owensboro-Daviess County CEO Tish Correa-Osborne. Phillabaum is originally from Tennessee, and she said when she was young, her mother and father divorced. Her mother, she said, was trying to escape her father, who abused both of them at times verbally, physically and sexually. For some time, she was in the state foster care system while her parents fought an intense legal battle, and when her mother finally regained custody of her, the two fled the state to Owensboro. For some time, she said, her mother worked three jobs to support them and wanted her daughter to grow strong, independent and empowered, despite her early childhood trauma. So at just 6 years old, Phillabaum became a member of Girls Inc., where she learned to come out of her shell and excel in ways she said she would have never imagined. Girls Inc. was a reliable and safe place for her to realize her passions and grow in the areas of science, mathematics and technology. They were confirmed for her when she attended an engineering camp for girls, where a passion for building, fixing and developing the world around her was lit. 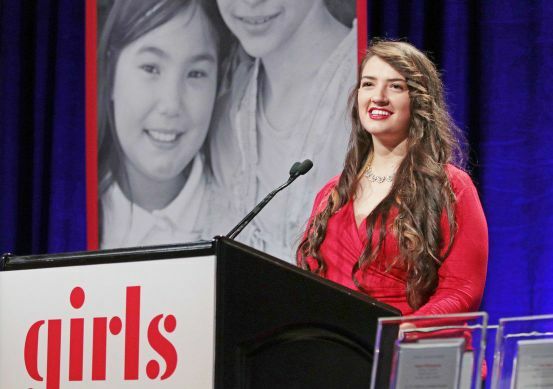 And none of it, she said, would have been possible without the help, love and support of Girls Inc.
That’s the message Phillabaum said she gave to the crowd of entertainment leaders at this year’s Girls Inc. luncheon. The event was held at the Beverly Hilton on the same stage as the Golden Globe Awards. She introduced Ryan, but other national scholars told their own stories of how Girls Inc. established their successes and introduced speakers such as Witherspoon, ABC Entertainment Group Senior Vice President Ayo Davis, Sonja Hoel Perkins, managing director of The Perkins Fund, and award-winning songwriter Diane Warren. To stand on stage with such talented and successful women was both terrifying and empowering, she said. She was honored by the experience and her trip to Los Angeles was something she said she’ll never forget. Osborne has been a personal mentor of Phillabaum for many years. Phillabaum, Osborne said, is an example of how Girls Inc. can reshape the life of a young woman and build her up to be a bold leader in today’s world. “She had unreal life circumstances growing up, and prevailed, excelling beyond belief,” she said. Phillabaum is studying both electrical and computer engineering in Louisville. She was inspired by a promise she made to her late grandfather, a retired electrician. She hopes to take her skills abroad to help those less fortunate in Third World countries. She says she is driven and prepared to meet the challenges of the future.